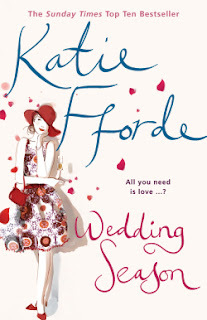 Today I'm sharing my review of Wedding Season by Katie Fforde which I borrowed from the library. I have read many of Katie Fforde's books and I would class the author as British chick-lit, it's not a genre name I'm particularly fond of as it often has negative conotations. It's a boy-meets-girl romance but I always find Fforde's characters well-rounded and her writing comprehensive, it certainly isn't sloppy or lazy. Sarah Stratford is a wedding planner hiding a rather inconvenient truth - she doesn't believe in love. Or not for herself, anyway. But as the confetti flutters away on the June breeze of yet another successful wedding she somehow finds herself agreeing to organise two more, on the same day and only two months away. Luckily Sarah has two tried and tested friends on hand to help her. Elsa, an accomplished dress designer who likes to keep a very low profile, and Bron, a multi-talented hairdresser who lives with her unreconstructed boyfriend and who'd like to go solo in more ways than one. As the big days draw near, all three women find that patience is definitely a virtue in the marriage game. And as all their working hours are spent preparing for the weddings of the year, they certainly haven't got any time to even think about love. Or have they? I found this a fun and lively read with great episodes of humour. If you know a Bridezilla or have ever been involved in planning a Wedding, there will be plenty of "Yep, I get that." moments. It really does have a great story and if you enjoy Weddings and all the trappings that go with it I have no doubt you will enjoy this. The three women really do grow and learn to bloom throughout the book, especially Bron. It is a little shallow in places but it is what it is, if you're expecting fiesty feminist females then you will probably be disappointed. Don't be deceived though Sarah, Elsa and Bron are all strong women running their own businesses, they just seem a little too suspectible to male charm at times! At the end of the day it's a piece of romantic escapism, and makes an ideal holiday read. First Published in 2008 by Century. Share book reviews and ratings with Tracy, and even join a book club on Goodreads. All written content is the intellectual property of me unless stated otherwise. (All errors are my own.) Please do not copy my words to use as your own - as whole or in part. All images either belong to me and may be used only if linked back to me & fully credited. For use in publications, please contact me before using. My email is on my contact page. Other images that feature are sourced from the free public domain & are used for illustration purposes or full credit is given. However, if you think they belong to you, please contact me and I shall remove them or credit them to you.